Your Wedding Photographs are the most important photographs you will ever have taken. 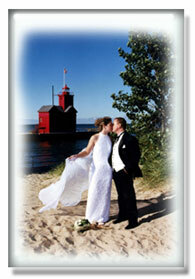 The way you look in your wedding photographs will provide memories that you will treasure for a lifetime. Imagine looking absolutely sensational in your wedding photographs. With fabulous wedding photography and strikingly distinctive Designer Style Photography. and the surrounding west Michigan communities. That's more photographs than any studio we know of. And imagine working with a wedding specialist - to get the beautiful look you want for your wedding photographs. Imagine getting more photos, more subjects, more coverage, more locations, and more services than you ever dreamed you could have - and all for less money! Now imagine a wedding photography studio that not only gives you all this - but that lets you keep the digital files for your wedding pictures on a DVD or CD right along with your photographs and album! Your Digital Files - All for One Low Price! You'll save hundreds of dollars and be able to get all those extra photos for family and friends that you thought were going to be so outrageously expensive. And you'll get all the original clarity, sharpness, detail, and rich color that you've come to expect from quality photography. No muddy scans -- just the sheer quality that comes from photographs made directly from the Digital Files. And you own them! Load them into your computer. E-mail them to family and friends. Upload them to your website. Make slideshows. View them on your TV or iPod. of art and science. With us, it's a passion. And to insure you get great photography it must be. It's essential to know the right things to do...and to do them correctly! some cards claiming to be a wedding a photographer. will, you won't find the true facts you need. that everyone has come to accept it as fact. DOWNLOAD THIS FREE PDF BOOKLET NOW. and get the quality wedding photography you want!